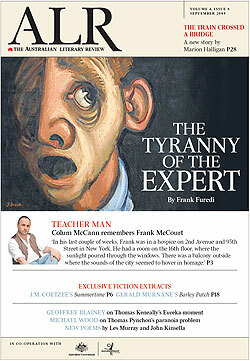 Just a reminder that The Australian Literary Review is free in today’s Australian. As usual some of the highlights are online, not least Delia Falconer’s review of J.M. Coetzee’s Summertime and Michael Wood’s look at Thomas Pynchon’s Inherent Vice, but as usual the bulk of it is only available in the print edition (though over at Australian Literature Diary Kerryn Goldsworthy attempts to straddle that divide with some thoughts about her print-only review of Cate Kennedy’s new novel, The World Beneath). So what are you waiting for? Go out and grab The Oz and do yourself a favour.